Social Stream moved very quickly during the interview with Bob on Tuesday, September 25th! I wanted to publish his answers to a couple of the very commonly asked questions I saw floating around in the stream, and hopefully answer a couple that he didn't get to. What did you guys do when you installed the cam? Bob Anderson directed the installation. He designed and tested the equipment, planned and oversaw the deployment, worked with Dave and Neil via the webcam to make sure everything was installed correctly, and staged on the ladder to help pass equipment. Neil Rettig and Dave Kester climbed the tree. They cleaned the old camera dome, replaced the broken IR cam, removed an unnecessary screw, and added two new cameras: a new PTZ and a very high resolution fixed bullet cam. As Bob pointed out, we'll have new views. You will sometimes be able to see one of the cams appearing on screen. Jim and Charlie worked on the computer and power protection systems and helped haul equipment. Amy Ries briefly staged midway up the tree to help get the camera bag up, set anchors, and helped haul equipment. We have a new PTZ cam, a new high resolution fixed cam, new views of and from the nest, better surge suppression and electrical protection, new video cards, and a new system to switch back and forth between the cams on site or remotely. Kudos are due John Howe for designing the switching system, and Kenny from Simms Electronics for his technical assistance and computer systems. When is the cam turning on? We don't have an exact date yet. We need to get a T1 line pulled in for faster service and make some changes to our computer system. It will be sometime between mid-October and mid-November. Chat will re-open in February. We will announce an exact date as it gets closer. How did Mom and Dad react to the camera installation? Mom and Dad weren't at the nest when we got there. They did fly by in the early afternoon and vocalize two or three times before leaving. We saw them briefly soaring over the bluff later in the day, which was warm, windy, and perfect for flying. Are Mom and Dad already working on the nest? Yes, they are! They have begun adding crib rails to the side in preparation for next year's brood. Were you able to get permission to lighten the nest? Who would you get permission from? The US Fish and Wildlife Service oversees permits and other issues related to the Migratory Bird Treaty Act, including falconry, raptor propagation, scientific collecting, special purposes (rehabilitation, educational, migratory game bird propagation, and salvage), take of depredating birds, taxidermy, and waterfowl sale and disposal. We have permits to go into the nest and install cameras, and we have permits to band and attach transmitters to eagles, but we did not get permission to lighten the nest this year. Bob pointed out that Neil, Dave, and all the gear weighed more than the eagles were likely to bring in this year, so we think the nest will be fine. We'll probably ask again next year. Did you leave a treat for the eagles? We usually do, but we did not this year. Fortunately, they didn't seem to hold it against us. Is the crossbow dangerous to the eagles? We use a dull bolt, but we also don't shoot the crossbow when the eagles are in or near the nest. We don't want to take any risks with them. Will Mom and Dad migrate? Probably not - they have a history of staying through the winter. Eagles are partial migrators - that is, some eagles migrate and others don't. For eagles to be non-migratory, there must be sufficient food during the winter. The Decorah eagles have a nest in a relatively sheltered location, with ample access to food year round. The adults are not migratory. Are D13 and D14 still around? Probably for D13 - D13 was believed to be spotted recently, but we don't know for sure. Why do these eagles always lay three eggs? Less than 1% have four eggs. Food availability impacts Bald eagles in a number of ways, although there is a lot of debate about whether or not it impacts clutch size. Some studies say 'No', while others hint at a link. Our nests don't make it any clearer either way: one nest (the Decorah nest) has a reliable high-quality food supply in a relatively sheltered area, while the other nest (the Fort St. Vrain nest) is at the foot of the Rockies in an area with harsh weather and a more limited food supply. Yet the eagles at both nests have a tendancy to lay three egg clutches. We don't know why. Are you going to turn the nightlight off this year? No: the nightlight is infrared light, which the eagles can't see. Click here for more information on the IR cam. Are you going to have cameras in the kestrel nests? We don't have any plans to do so right now. The kestrel project is a pilot that explores using county right-of-ways along gravel roads to expand the kestrel population. We don't easily have a way to get power or connectivity out to the boxes, which are located in remote areas. If you would like to learn more about that project, click here. What was that about Philippine Eagles? The Raptor Resource Project will be working with the Philippine Eagle Foundation to raise awareness of the highly endangered Philippine Eagle. From the foundation: The Philippine Eagle Foundation firmly believes that the fate of our vanishing Philippine Eagle, the health of our environment, and the quality of Philippine life are inextricably linked. We are therefore committed to promote the survival of the Philippine Eagle, the biodiversity it represents, and the sustainable use of our forest resources for future generations to enjoy. We plan to add a Philippine Eagle cam and help sow the seeds for a recovery effort for and by the Philippine Eagle. We will post more about that as it gets underway. Back in Decorah, Bob took some time to track D14 this afternoon. He writes: "I had a bit of free time this AM so I tracked down D14. 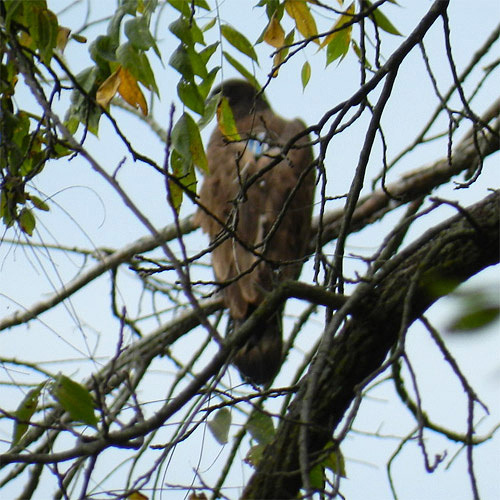 He was perched in a white pine tree on the top of a bluff overlooking the Upper Iowa River. There were two adult eagles perched nearby. I returned to this area a few hours later and got a beep pointing down stream. I got a booming signal when I pointed the yaggi at three immature eagles soaring high over the river. 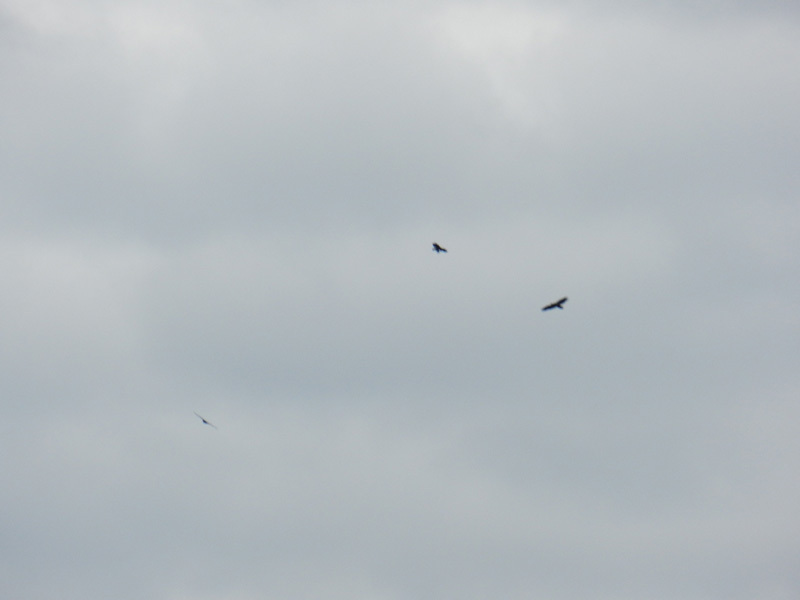 They were so high up I could not tell which one was wearing the transmitter." 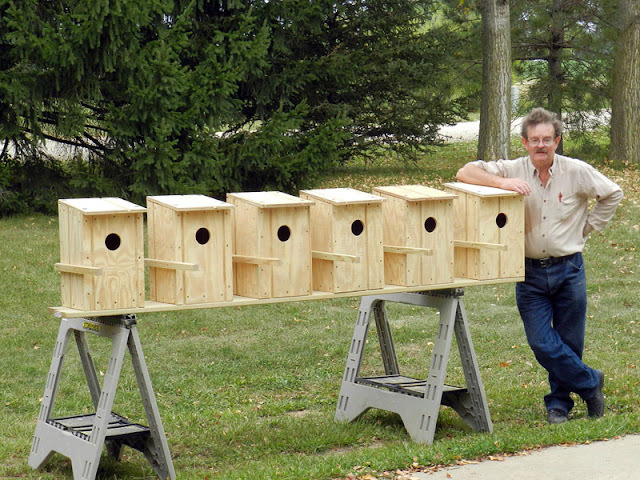 7 nestboxes in 2 days! So why use rural ditches? Bob started talking about ditches as a sort of habitat of last resort in heavily developed areas. I don't tend to think of farmland as heavily developed, myself - it's all green, right? - but mile after mile of row-cropped corn and soybeans is not a natural environment. As grassland and pothole prairie are converted into farmland, animals and birds are forced into ditches. Water, rodents, insects, and plant life attract a wide variety of larger animals, including deer, rabbits, woodchucks, gophers, mink, muskrats, badgers, fox, raccoon, skunks, snakes, frogs, red-tailed hawks, harriers, kestrels, sparrows, mourning doves, gold finches, bobolinks, and pheasants. A little back-of-the-envelope calculation. Iowa contains a total of 36,016,640 acres. Over 90%, or 32,414,976 acres, is under till. So how much of what's left is ditch? That's a hard question. The DOT manages about 175,000 acres along interstate and state highways, but that figure doesn't cover county, city, and town roads. When those are added in, the total jumps up to about 1.6 million acres, or 44% of the remaining 3.6 million acres left. Although broken and fragmented, that is a lot of potential habitat. 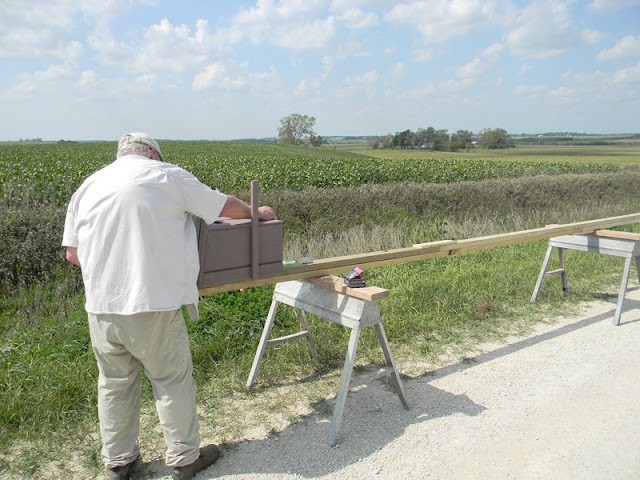 Winnesheik County gave us permission to install nestboxes along 5 miles of dirt road in rural Bluffton, Iowa, and the fun began! Now for the posts! We weren't able to get 18’ 4x4 posts, so Bob ordered 15 green-treated 2x4 boards. 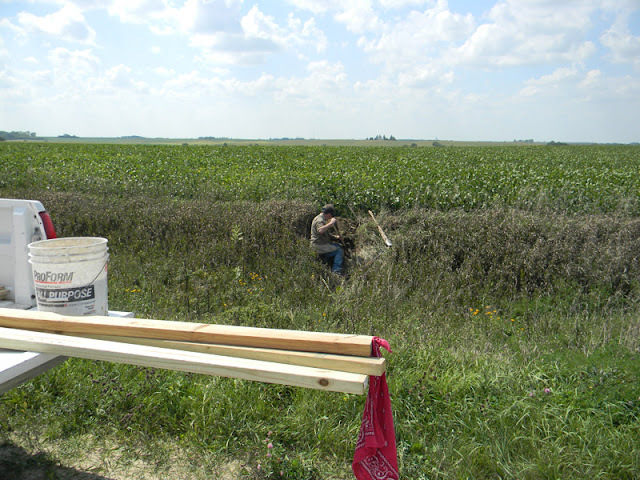 He decided it would be easier to haul materials than posts, so we constructed the posts on site by gluing and screwing them to create a laminated 4x4x18' pole. Voila! Strong enough to stand against the wind, yet still break away against cars, trucks, tractors, and other vehicular interlopers. Last Tuesday dawned hot and humid! Bob and John borrowed a truck from camera operator Charlie and set off. The procedure went something like this: they reached a spot, stopped the truck, put up orange cones, and went to work. While John dug a fout-foot deep hole (among many other things, John is a mason), Bob built the pole, attached the pre-made nestbox, and added about two inches of sand in each box. Once the hole was dug and the box was ready, we levered the box up and into the hole. We added dirt, tamping roughly every two inches. When the hole was about half-way full, we added roughly a five gallon bucket of gravel, tmaped that, and finished with dirt. The gravel compacts extremely well - almost like cement - and provides drainage to help keep the wood from rotting. The next day we installed a peregrine nestbox on a cliff just south of Bellevue, Iowa, at Bellevue State Park. 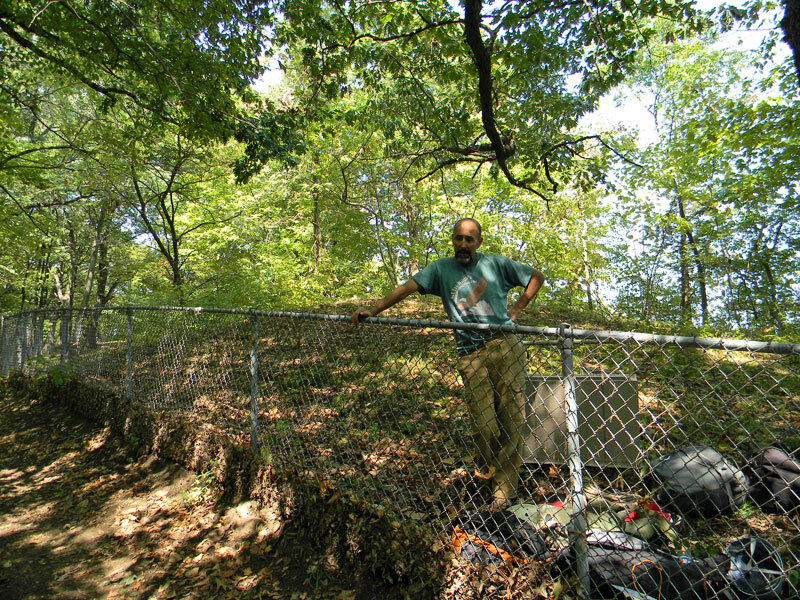 We were were very pleased to find Indian mounds at the top of the cliff, just above the spot we intended to hang the nestbox. Although these were conical mounds, the Mississippian people revered the falcon and built falcon mounds. It seemed like an appropriate place to put a falcon nestbox. We were joined by Pat Schlarbaum from the Iowa DNR and Park Manager Shannon Petersen, who helped carry gear and were in general very enthusiastic about the project. Bob went down the wall to find a good spot for the nestbox. It has to be unavailable to raccoons (as usual, we found raccoon poop all over the ledges), fairly flat, high up, and visible - it can't be hidden behind foliage. Once he tagged a spot, he came up, cutting brush out of the way to make it easier to handle the nestbox. 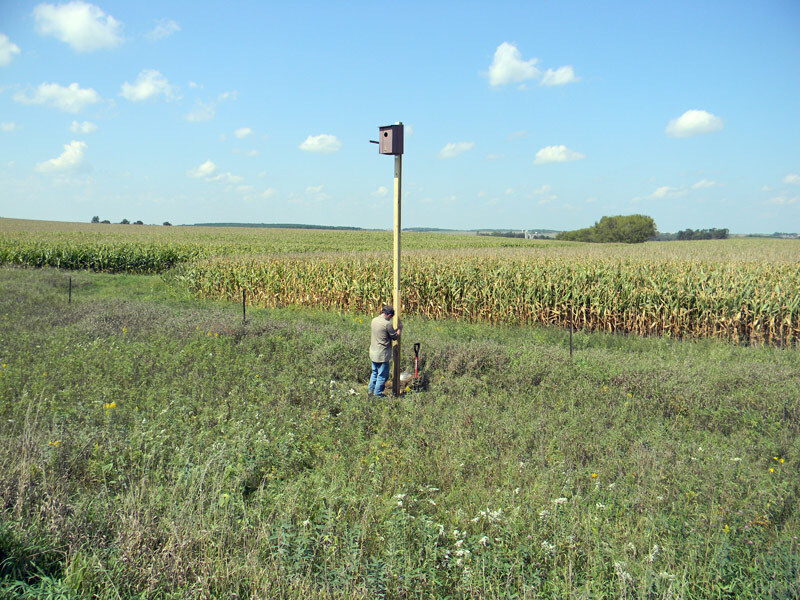 The nestbox is roughly two feet by three feet, weighs 30-40 pounds, and is constructed of T11 siding in a steel frame, which will not warp or pull off the anchors. It can be a bear to handle, especially in thick brush. The time we took to cut away branches and vines saved us a lot of work! Bob lowered the nestbox to me, on a ledge, and I caught it and carried over to the edge, belaying it down to Dave. As usual, hazards included rocks and the box itself. 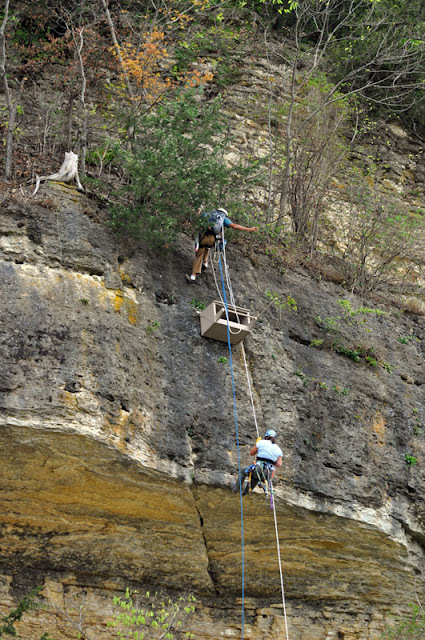 Bob put a long rope on the bottom side of the box, which made it much easier for those of us below him to guide it over cliff edges and keep the box away from rocks. I got the box down to Dave and then joined him on rope, where we levered the box into place and anchored it to the wall with our awesome new hammer drill (donated by Pat Schlarbaum, thank you very much!). Once it was firmly in place, Bob lowered down 80 pounds of pea gravel and a perch. We filled the box with the pea gravel (roughly 3 inches deep, to add drainage and prevent egg breakage), attached the perch, and got off the wall. 7 nestboxes in 2 days - done! Note: We forgot to add sand to one of the kestrel nestboxes, so Bob and John went out to fill it late last week. They saw 8 kestrels between the first box and the last box, and one box already appeared to have been claimed by a male. We anticipate banding babies here in the spring! 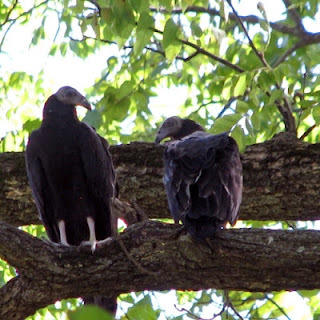 "The turkey vultures are now able to fly very capably with strong wingbeats, but still are staying close to their "home territory". Presumably their parents still return to the area to feed them. One would guess that the young birds get some valuable flying practice following each feeding and emulating the departing parent; however, I have not yet had the opportunity to observe it. Today, first one and then the other adolescent left its perch, in strong flight low above the surrounding treetops, easily gaining altitude. Their flights were observably strong and accomplished." D14 remains near Clermont, Iowa, while D1 is still up in Polar Bear Park, albeit on the southern end. Both Mom and Dad eagle have been seen near their nest, and we anticipate that they will stay through the winter once again. We don't have a date for cam turn on yet, but I'll post here once we do.